Parasol literally means to shield from the sun. Let me tell ya, anyone who has been in full costume during a Florida summer knows a parasol is worth considering. Don’t forget, they are fun to swish around too. Once you have decided to incorporate one into your ‘look’ the next step is choking on the price of even simple ones. But an umbrella is much too big to take seriously as a parasol. Not only do you look ‘wrong’, you have a heavy, space hogging object that folks at a Con are going to be glaring at…yes, even the cute young things get the hairy eyeball in a crowded hallway. 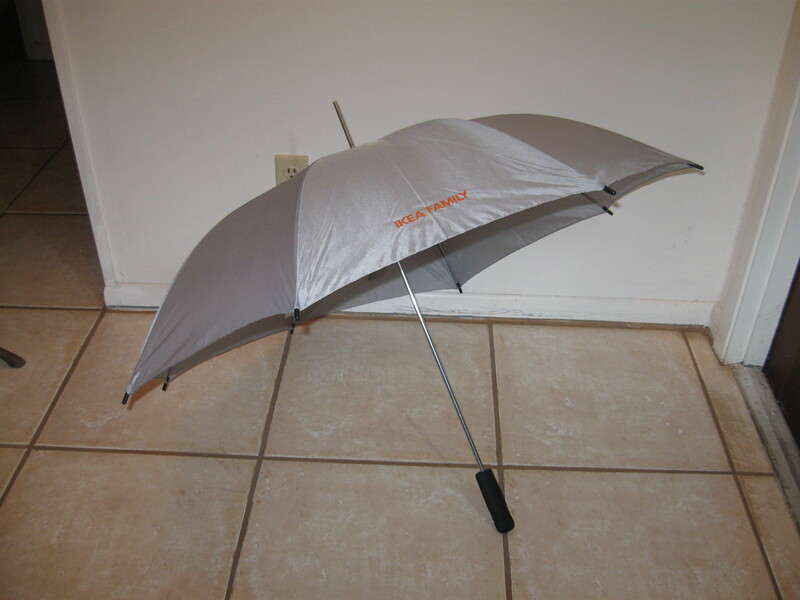 So, I’m turning a $1.99 IKEA umbrella into a dainty yet effective parasol. Are you going to use other fabric or just reuse what is there? Are you going to decorate it? Have some plan/sketch/idea in mind before you start clipping and cutting. My plan is to reuse the gray fabric but embroider every other “pie slice” with a Koi. Since the fabric is gray, I’m adding orange, black and white Koi. There are 8 ‘slices’ so I need 4 designs. I’m hoping to have the designs cut-out. We will see if I can get it to work. Take a look underneath. Where do the parts move? Don’t plan anything that interferes. You don’t want a parasol that doesn’t collapse on command. My sewing machine collection is bordering on the ridiculous. I had my old Kenmore bought when I was pregnant with first child (~24 yrs ago) and my Robot, a Janome MemoryCraft I got second hand in a flurry of spending after my divorce. It took me a year before I would even use the Janome because I was so intimidated by a machine that had 4 instruction manuals. And I had to use the accompanying VHS tape to figure out winding the bobbin. The Robot and I became friends and have trudged through many a mile of tulle, stabilizer and broken needles. Lately, I’ve succumbed to the lure of a treadle and have picked up three machines at flea markets, oh so cheap. Two run and the third is for parts. Love them, so fun. I like to pretend I will learn to quilt. Of course, what I’ve wanted for a long time has been a serger. But every time I looked I would fall for the TOL (top of the line) version (not even close to cheap). Last spring it was the Babylock Evolution during a demo. What a fab machine! Friendly. No scary tension problems, no complicated threading. The frightening part is the price. $2400 gasp! So, I start saving up and saving up and saving up. A few weeks ago I head over to my favorite Babylock dealer and want to negotiate. The economy is tanking, I figured that with cash in hand I might get a better deal. Nope, in the last few months the price has gone up. $3000. (I would gasp, but I felt gut punched) Now, even a brat like me knows that I can’t rationalize that amount on my hobby. So, for the first time ever, I settle for second choice. I found a used Huskylock 910 on craigslist for $500. And by used, I’m talking one of those machines that has been sitting in someone’s closet since she finished her free training class. The threading? Not at all as scary as I was led to believe. Best part is the tiny rolled edges and clean seams in our future. So, the Robot is now sharing her table with the Newbie. I’m sure Jamie, Meg or I will give her a better name once we put a few miles on her.